Fox Typewriter Co. V. Corona Typewriter Co.
Who or What killed the Fox Typewriter Company? Was it Colonel Mustard, in the study, with the candlestick? 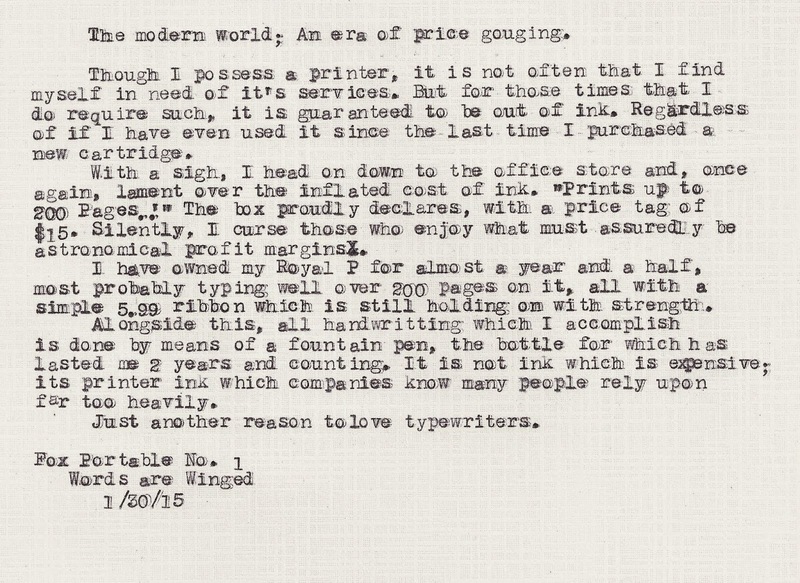 Was it an evil and diabolical plan by typewriter-anarchists, bent on overthrowing the typing world one factory at a time? Or was it simply a lack of positive marginal return on produced machines alongside the heavy burden of a legal dispute with another company? But! Who won the lawsuit? Well, many might say, obviously Corona. After all, Corona stayed around and Fox vanished into the oblivion of bankruptcy. In lawsuits, it is usually the standard to have the Plaintiff stated as Vs the Defendant, rather than Defendant Vs. Plaintiff. 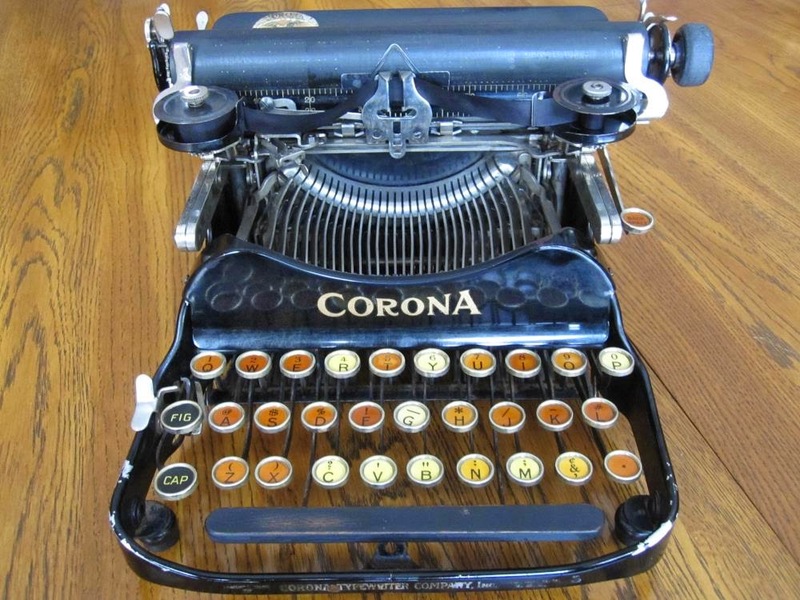 Thus, as we find, the lawsuit was considered as the Fox Typewriter Co. V. Corona Typewriter Co. If the evidence presented is true, then Corona did indeed instigate the lawsuit and brought forth 8 patents which it believed Fox infringed. 6 of those 8 were considered as validly held by Corona, and 5 of those 6 were considered infringed by Fox. All in all, the case took from June/July of 1919 to August 27th of 1920. Of note, however, is that the apparent ruling in 1920 may have not been the end of it all. 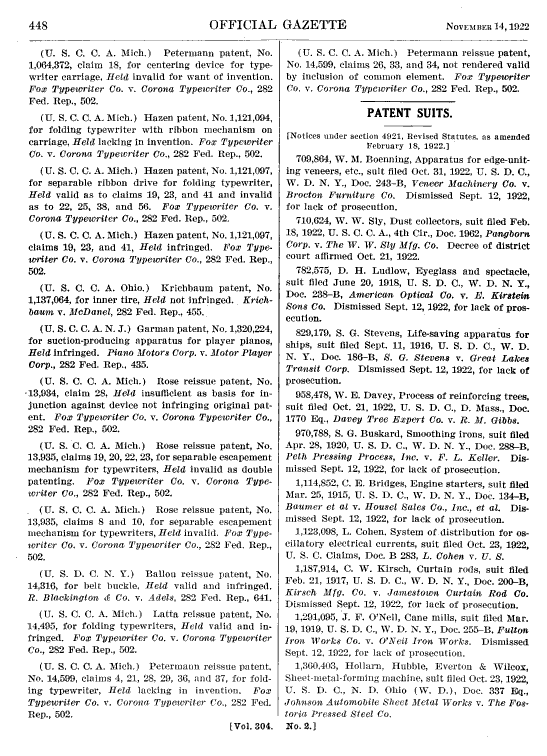 The date, if you'll look closely, on the gazette of the patent office is 1922. Fox was still in business by 1922 if sources are to be believed, and at that time just having started its production of the Model 3 portable known as the Sterling. 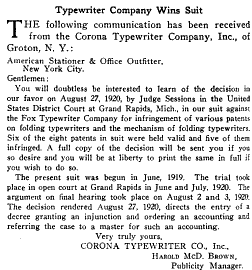 Thus, unless the gazette was reporting on the decision rendered in 1920, then the lawsuit continued past the point of the intial verdict perhaps due to a counter-suit, or perhaps Corona decided it could bring a competitor to its knees once and for all, and keep its large market share, by throwing more and more allegations at Fox. 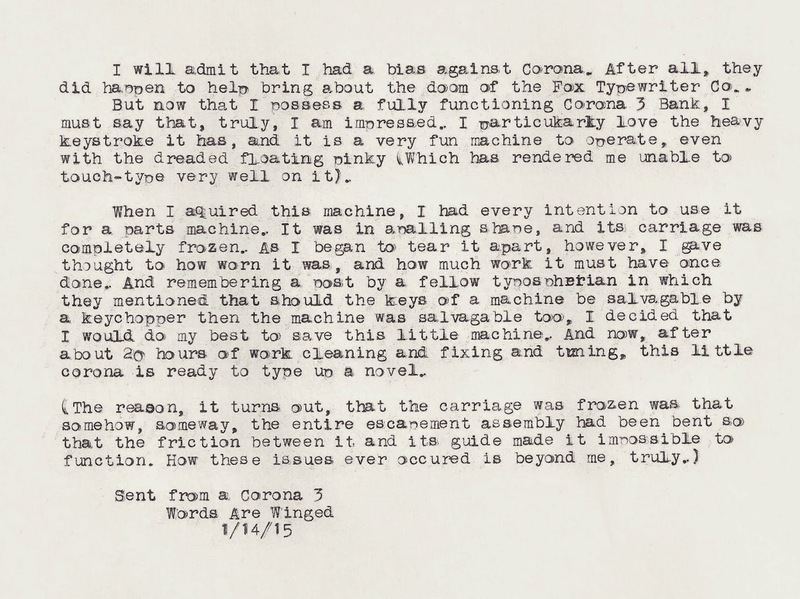 For a market share comparison between Fox and Corona, Corona produced roughly 480,000 machines between 1917 and 1923. Fox was able to almost match that with around 13,000. In other words, Fox produced about 2.7% the amount of machines Corona did. The point of all this? The battle between Fox and Corona was a very uneven fight, but Corona started it and Corona finished it. The poor light running Fox never stood a chance. Side note: At one point, Underwood sued Fox over patent infringement. Either Fox was a little less creative in its designs than one would have hoped, or the big bad companies were out to squash the little guys.